Congratulations on your purchase of the APU 4000LX Power Bank & Flashlight from US Digital Media! To ensure a long service life and optimum functionality of the product, we recommend that you read these instructions carefully. 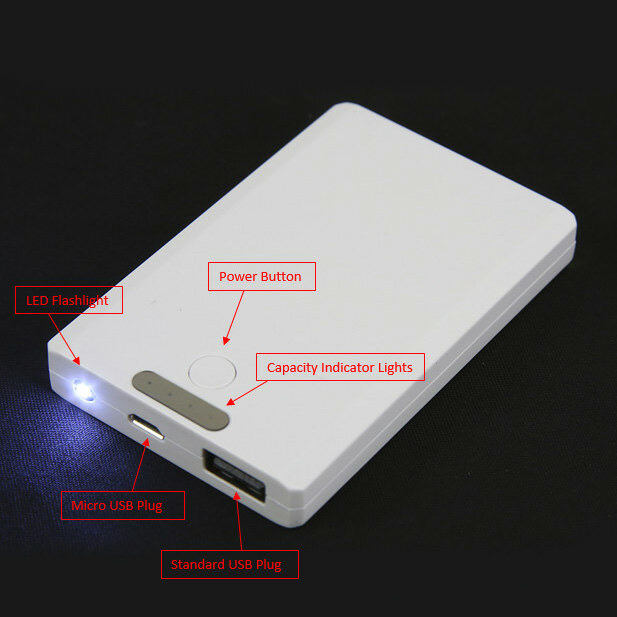 It is recommended that the power bank be fully charged before first use. When power bank is off, insert the micro USB plug into the appropriate port on the power bank. Insert the standard USB plug into any USB port with a power source. During charging, the four indicators will light one by one. When all 4 lights are lit, charging is complete. Disconnect the charging cable from the power bank and the power source. Press the Power button. The 4 capacity indicators show how much capacity remains. To turn on the LED flashlight, press and hold the power button. To turn the flashlight off, press and hold the power button again. When the last indicator begins to blink, it means the power bank's capacity is lower than 25%, and the power bank will need to be recharged.